Thanks to Tim O'Dowd for the pictures below. Above is the first part of the race. If you want to see the rest of it, to parts 2 and 3. This is pretty good and shows some nice up close shots. 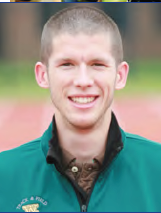 Listen here to hear All-American Wilhelm Patterson talking about this afternoon's meet. Sorry about the background noise, but we taped it as the team was driving back from the airport (the marvels of modern technology!). Well I counted three mistakes and it's only a few paragraphs, but at least they have something. 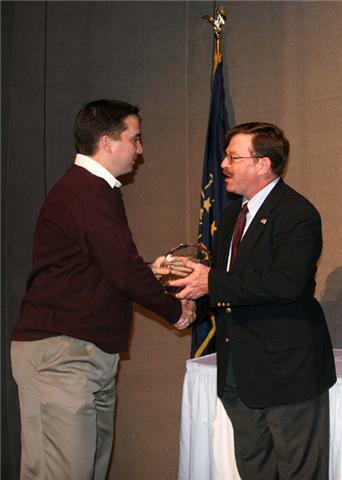 Gibby receiving the Southeast Regional 2009 Cross Country Coach of the Year Award from MONDO USA's Ed Gorman at the NCAA Div. I XC Banquet on Saturday. The NCAA meet will be streamed live by the NCAA here (look the upper right hand corner where it says "video") or you could watch it on television on Versus. The men's coverage starts at noon on Monday. Above is a preview of the course the men will running on at 12:08 pm EST. I believe Letsrun.com called it perfectly. If W&M can get out, they will be 6th with no one in the top 25. It will mean that Wilhelm and Grey are in the second half of the All-American crowd. If you are so inclined, you can watch the live prediction show on Flotrack at noon on Sunday. Just come back to this site and you will be able to watch it from "here." This article gives the men's team a chance "for the podium" if they can get their number one in under 30 and have the 30-45 second spread they have maintained all season long. Also Let'sRun picks the men to finish seventh. Here is the link to Flotrack which will be covering the meet live. The race itself will start at 12:08 PM EST. 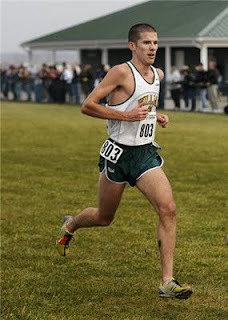 Jon Grey who transfered from Oklahoma two years ago has been running #1 or 2 all season and is looking to get his first All-American title on Monday. With a 28:55 in the spring he and Patterson Wilhelm will hopefully help the team to another top ten performance. Listen to him here. Jason is a fairly recent (hey I graduated in '86 so most people are "recent") grad of W&M who has continued racing and has coupled that with dentistry school. 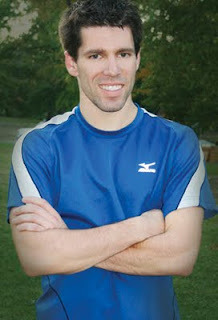 We also like him because he is now one of the people working on our next newsletter which is coming out in a few weeks. Here is an article on him. Unfortunately the women did not qualify, either as individuals or as a team for the NCAA meet next Monday. Please come back later for links to the live feed and results. The top video is the halfway point and has a good shot of the top two W&M runners and you can see them again on the bottom video. For what it's worth, Flotrack, predicts that the women will NOT make it to the NCAA meet as you can see in the video above (and the site was 100% correct last year). The video does say the women are one of the ones who will be close. The men won the Southeast Regional and are heading back the NCAA meet for the 13th straight time. Finishing order, W&M (49 pts), NC State (99 pts), Louisville, Duke, UVA, and UNC. For the women, Duke won followed by UVA. Patterson Wilhelm led the men finishing 4th with Jon Grey in 5th (30:07, 08). Leak was 9th, Gates was 11th and Sklodowski in 20th to round out the top five with a 45 second spread. Still haven't seen results on the women. The question isn't whether the men will make it back, but will they win the region again. Also, how high up will the women, who are ranked 5th in the region, finish? The men are at 10 and the women at 10:45 and you can check here to see the results. Coming this Saturday is the NCAA qualifier. Here is a preview for the women and here is the men's one. You need to toggle down the page to near the bottom for both previews.